Marshall University fans can show their support and pride for the Thundering Herd in many different ways, one of which is by wearing their green Marshall gear every Friday throughout the football season in celebration of Green Fridays and College Colors Day. Marshall will celebrate the 11th annual College Colors Day on Friday, Sept. 2. It is organized by the Collegiate Licensing Company (CLC), which coincides with “back to school” and the kickoff of intercollegiate athletics. By participating in College Colors Day, Marshall is continuing a tradition of encouraging members of the Marshall family to wear their Thundering Herd gear on this special day. Fans across the nation are encouraged to wear their college colors and support their favorite university. Marshall kicks off this season’s Green Fridays on Sept. 9 – the day before the Thundering Herd’s season-opening game at home against Morgan State. The game is scheduled for 6 p.m. at Joan C. Edwards Stadium. 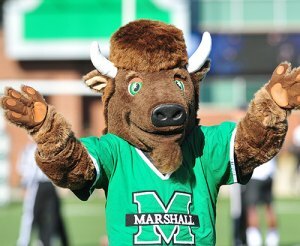 Leading up to game day, Marshall will celebrate the Week of Marco, in which the MU mascot will visit some local businesses each day during a 3-day period. Fans are encouraged to visit the retailers while Marco is there for the opportunity to win prizes, take advantage of special offers or snap a photo with Marco. Wednesday, Sept. 7 – Hometown Sportswear, 3 to 5 p.m.
Friday, Sept. 9 – Marshall University Bookstore, noon to 2 p.m.
Friday, Sept. 9 – Glenn’s Sporting Goods, 3 to 5 p.m.